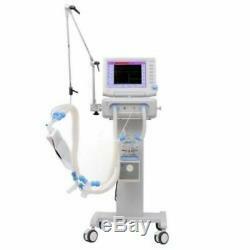 ICU treatment ventilator, very stable performance, safe and reliable, Can be widely used in emergency, ICU room, operation room and internal medicine ect. 12.1 inch TFT color screen , big screen could show more information. Screen could be rotated freely, suitable to operate in any angle and height. With heater device to prevent water into ventilator. Could show Paw-tFlow-tVolume-tPaw-VFlow-V five waveform at the same time, also could show one or several waveform according to our operation. Curve size , time scale, pressure-flow ratio adjustable, watch the details more good. Curve pause function, could watch details. Flow, pressure two trigger function, could effect at a same time. 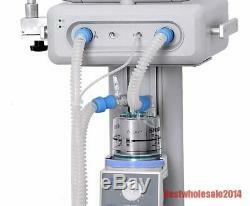 Automatically inspiratory synchronous nebulizing function, nebulizing time adjustable. 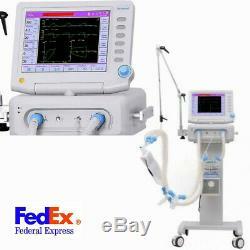 100% Oxygen inspiratory function, oxygen inspiratory time is adjustable. High, medium, low- grade alarm function. Alarm record functions, could record the last 100 pieces of information, show alarm grade, alarm time and the alarm parameter. Pressure, volume, time respiratory mode security, could inspect pressure in inspiratory phase, volume, time exceed the regulated value, turn into expiratory, ensure patient safety. Volume security function, keep the minimum tidal volume in pressure mode. 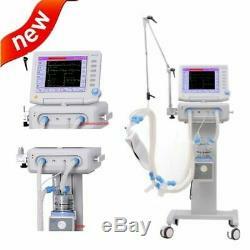 Adjust MMV function automatic, adjust inspiratory pressure and breathing frequency, approaching the target tidal volume and minute ventilator. VGA connector could output the screen signal to other screen(Optional). Assisted/Controlled Pressure Control Ventilation (PCV). Assisted/Controlled Pressure Support Ventilation (PSV). Application scope: Pediatric and adult. Driven mode: pneumatically driven and electronically controlled. Working mode: Pressure and volume. Ventilation wave type: squire wave, deceleration wave. PEEP/CPAP: 0 to 40 cmH2O. Flow triggered: 0.5 to 20 L/min, OFF. Pressure triggered: -1 to -20 cmH2O, OFF. Tidal Volume: 20 to 2000 mL. Breath frequency: 1 to 100 bpm. I:E Ratio: 5.0 : 1 to 1 : 5.0. Inspiratory plateau: 0 to 50%. Inspiratory Flow Wave Shape(VCV): Rectangular wave and Decelerating wave. SIGH: 1.0 to 2.0. Breath frequency(SIMV): 2 to 40bpm. Inspiratory time (SIMV): 0.1 to 12 S.
Pressure Support Ventilation (PSV): 0 to 40 cmH2O. Expiratory Sensitivity for PSV : 10% to 75% of the initial flow. 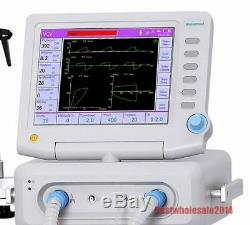 Maximum Inspiratory time (PSV): 1.0 to 8.0 S.
Pressure Control Ventilation(PCV): 0 to 40 cmH2O. Minimum Tidal Volume(PCV and PSV): 50 to 1500 mL. Backup Rate (PSV): 2 to 40 bpm. Object Tidal Volume(MMV): 20 to 2000 mL. Ventilation volume(MMV): 0.5 to 40.0 L/min. Breathing wave: Pressure vs time curveFlow vs time curve, Volume vs time curvePressure vs volume loops, Flow vs volume loops. Air source Low pressure alarm. Oxygen source low pressure alarm. Low noise medical air Compressor, very stable performance, safe and reliable. Air Compressor with LCD screen to display output pressure, provide safe, secure and permanent motivation. Compact design and easy to transfer. Assembled with clean control module, supplying cleaner and safer air to the patients. 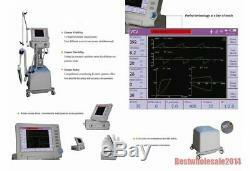 Match with various ventilator of international standard in the world. Efficient rate for particle filtration. Dew point of output gas. 220V±15% , 50HZ or 110V±15%, 60HZ. Main power: from 85 to 265VAC 47-63HZ. Estimated duration: more than 2 hours when completely charged. The display shows an icon with the charge level. Oxygen: pressure 2.8 to 6 bar ISO5359 connector. Air: pressure 2.8 to 6 bar ISO 5359 connector. This machine is customized and need take 15-20 days to produce. It takes approximately 15-25 days(USA , CA, AU, UK). Other country 12-35 days European, South America, Africa, etc. You pay us what you see on the invoice, i. The sale of this item may be subject to regulation by the U. 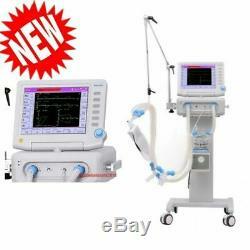 The item "12.1 Color ICU Treatment Ventilator Machine for Emergency Hospital CCU ICU Use" is in sale since Wednesday, March 13, 2019. 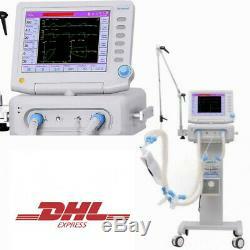 This item is in the category "Business & Industrial\Healthcare, Lab & Dental\Medical & Lab Equipment, Devices\Ventilators". The seller is "globaltrustshop888" and is located in Beijing. This item can be shipped to North, South, or Latin America, all countries in Europe, all countries in continental Asia, Australia.